Being a dungeon master is very different from being a player. Instead of just keeping track of one character, there is an entire world full of creatures, monsters, characters, and cities all with their own agendas and plot lines to remember. It’s a lot for any one person to keep all in their head, and many DMs will spend hours planning out campaigns, creating worlds, and designing locations and items. For players who haven’t been a DM, it can be hard to really grasp what is going on behind the screen. But it’s not as mystical as you think it is. For those of you who have never tried your hand at being a dungeon master, there are a few dirty secrets that you should know about being a DM. This might not be true for all DMs, but I can say with certainty that easily half of every session that I run is made up on the spot. And talking to other DMs, I can say that’s pretty average. This isn’t always because there is no plan, but more because players are unpredictable and don’t always stick to the plan. We don’t mind too much though. Part of the fun of being a DM is having to think on the spot and quickly make adjustments. A good DM will be able to do this so seamlessly (or nearly seamlessly) that you won’t know what was and was not planned. That kind of flexibility takes some practice and does occasionally lead to some problems—but we’ll get into that in another post. As a player, what this means for you is that whenever you ask your DM something, and they stare at you for a moment, start scrambling through notes, or hesitate before answering… you need to be patient. There’s a good chance that you just derailed something and it may take a few moments for them to gather the scraps of story and get everything into some semblance of order again. 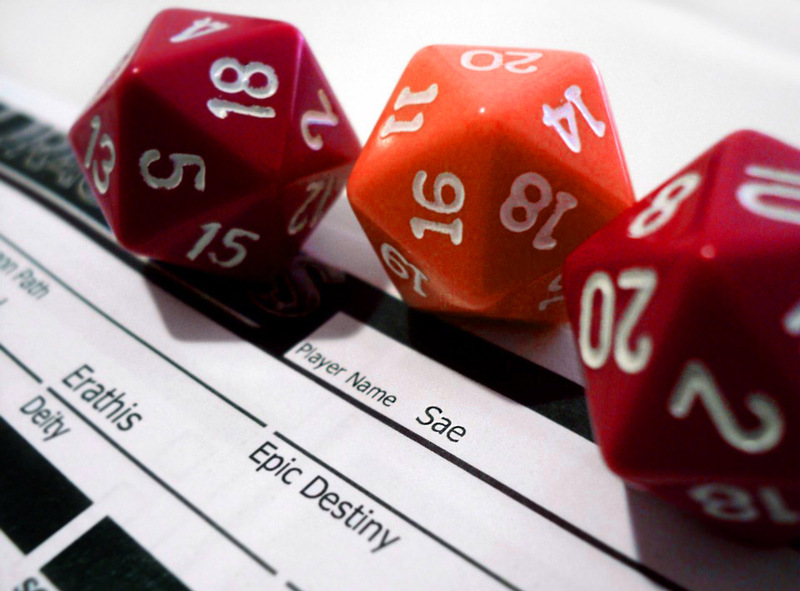 Despite what it might seem like, what with throwing all the traps, monsters, and plot twists your way… your DM is actually not your enemy. We’re here to tell a story and a huge part of that is setting challenges and obstacles in front of the party. The ultimate goal might be to kill you, but it’s not going to happen without some kind of warning that you should be cautious or even run. Believe me, if your DM wanted your character dead, it would be all too easy to do so. As a player, this means that while yes, you definitely should be wary, some of the paranoia about instant death is likely unwarranted. Instead of fearing that we’re going to instantly smite you, instead look for clues on whether you’re expected to run or fight, be cautious or be brave. It’s all about context. DMs love challenges and seeing players work through them, so usually the more excited we are, the more cautious you should probably be. Don’t get me wrong, your DM probably has a lot of really fantastic ideas and things that they are just waiting to put into play. I’ve been itching to send my players into the desert for months now, because I have so many ideas for it. There are twice as many resources for DMs as players, and a good DM will be the kind of person to create things constantly anyway. However, without a doubt my absolute favorite thing to do is to listen in on my players plotting and discussing (both in and out of game) what they think is going on. Some of the things they come up with are just way crazier than anything I would ever have thought of, and some of my better ideas are modified versions of my players’ paranoid ramblings. What this means for you as a player is simply to continue doing what you’re doing. Don’t try and hide things from your DM, and don’t hesitate to discuss things in front of them (no matter how terrible the idea may seem). Being a DM can be difficult sometimes because you can’t talk about your ideas like the rest of the group can… so letting them sit in on your musings is sort of a passive way for them to get their creative juices going and it will result in a better game overall. Without a doubt, this is one of the more controversial aspects of being a DM, even in the community of DMs and GMs. But, before you become outraged at the idea that your DM is not being completely honest, you should know that a majority of the time that fudging is actually done to help you, not to kill you. And, most of the time anyway, it’s because we messed up somewhere. The fact of the matter is that fudging rolls and stats is usually done to make the game more balanced. Sometimes we’ll overestimate things and realize mid-battle that the enemies were too strong (and not in the give-them-a-challenge kind of way, more the kill-everyone-in-two-turns sort of way). I also occasionally will fudge monster HP in order to make a battle that is dragging out end faster. Most DMs will never fudge a die roll in order to harm players. As a player, this shouldn’t effect a thing for you. Never assume that your DM is fudging stats, and for the love of the game, don’t accuse them of doing so. Remember that their goal is to make it fun, and that yes, we’re human too. We are going to mess up sometimes, and if you have a good DM, fudging is all done in the name of the story. I have been DMing for more than a decade and I can say with confidence that I had absolutely no idea how to solve some of those challenges that I’ve thrown at my players. There was no right answer; usually because I didn’t bother coming up with more than the problem. Beyond that point, it was all up to my players. Now, not all DMs are like that, I should note, but there’s an unpredictable element to most groups that will sometimes make it an exercise in futility to try and predict how to solve some problems. Instead, most of us just make sure we understand the ins and outs of the problem and let you go to town on it. After all, the four to six of you are probably going to be able come up with a much better solution that I could on my own. For players, this doesn’t really matter all that much, other than to not underestimate the powers of working with your group to come up with a creative solution. You’d be amazed at how many different ways there are to solve everything—I know I continually am surprised by the clever, ridiculous, and effective solutions that my groups somehow pull out of thin air. So next time you’re stuck, take a good look at your gear, your group, and the problem. There’s probably a solution there somewhere. Just don’t look at the DM. Yeah, my first and only time DMing so far I had to fudge a few rolls with a face hugger type thing. It was weak but super fast and my PCs had such bad luck; they couldn’t hit it! It almost chipped the bard to death and I realized that maybe I messed up with this creature somewhere lol. Love your 5 DM secrets! How true. We were in a dungeon once when we came to the end of a long corridor marked with one of those sandwich-board type signs designating a detour. It said “No Entry”. Well, we weren’t going to be put off by that! We must have spent an hour asking questions, searching for secret doors, etc. when he, exasperated, finally said, “I HAVEN’T FINISHED THAT PART OF THE DUNGEON YET!! !